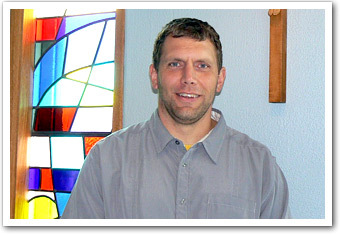 Michael Buhler is the Pastoral Care Worker for the Northeastern Catholic District School Board. The Northeastern Catholic District School Board is pleased to offer the services of our Pastoral Care Worker, Michael Buhler, to our students and staff as part of our effort to enhance and enrich our Catholicity. Mr. Buhler continues to be active in all of our school communities, visiting classrooms and working with our teaching and non-teaching staff members. In collaboration with our teaching staff, he enhances and supports the Catholic values, policies and goals of the Board. Mr. Buhler works with liturgical committees and supports the faith journey of students through relationship building, counseling, opportunities for faith development and retreats. He offers support to teachers in infusing Catholic teaching into all subject areas. He also serves teachers and other staff in adult faith formation. He raises social justice issues with students and staff and provides relevant information as to how we might respond as Catholics to global issues. As a spiritual guide, he provides insight and gospel teachings while promoting and modeling the mission statement of the Board to "...guide our students on a journey of discovery that celebrates life." OCSTA president, Marino Gazzola was interviewed as was Dr. Mark McGowan (historian and former principal of the University of St. Michael's College). Other voices in the article include that of Peterborough Catholic DSB parent Lorrie Baird, among others. This image of the learner was developed by the Institute for Catholic Education in consultation with representatives of the Catholic community across Ontario. The life roles, knowledge, skills and attitudes outlined in this document describe the distinctive expectations that the Catholic community has for graduates of Catholic secondary schools. These expectations are based on research which identified current and future educational goals and priorities across the province and enhance the expectations of the Ontario Ministry of Education and Training as outlined in provincial curriculum documents. Virtue: A Virtue is a habitual and firm disposition to do good. It allows the person not only to perform good acts, but to give the best of themselves. The virtuous person tends toward the good with all their sensory and spiritual powers; they pursue the good and choose it in concrete actions.